Would an Elvis fan pass through Memphis and not try to stop off to see Graceland? The same goes for any Route 66 buff. If you are in or about the central Illinois corridor, you most definitely want to consider stopping off in the town of Pontiac to feast your eyes on a motherload of the Mother Road attractions. There is so much Route 66 nostalgia to see, one may want to wander and get lost amid the many sites of Pontiac. I would actually suggest doing so. 1) Understand heritage attractions verses tribute attractions. The Pontiac area is made up of both original Route 66 landmarks, also called wayside attractions; as well as many tribute attractions. Both are worth seeing, but knowing the difference can help you decide how you want to go about seeing everything. The wayside or heritage attractions are landmark locations that are original. This part could be called a ghost tour of sorts, as many, though not all of the sites are mere remnants of the original. These are either road markers, signage, or a structure of some kind that still exist in the same location now as when the route was in existence. Each wayside attraction is delineated with a stainless steel marker which provides interesting facts and information about the location. Route 66 Hall of Fame and Museum is located in the old fire department. Obviously the museum was not around during the life of route 66, but it contains many artifacts and memorabilia that are original. The first of note is the Wishing Well Motel Marquee and the iconic Wishing Well itself. These two pieces were salvaged from the original Wishing Well Motel in La Grange, Illinois, which is no longer in existence, but a landmark spot for travelers along Route 66 even back in the day. The museum also includes Route 66 – A Photo Journal, from photographer Michael Campanelli. If you never make it along all of Route 66, these photos are a wonderful way to see the journey from start to finish. The additional tribute attractions are abundant in Pontiac from the Pontiac-Oakland Museum to the Murals by the Wall Dogs. There were over 20 murals completed in a matter of three days in 2009 by the Wall Dog mural group capturing the history and heritage of Pontiac, including the Route 66 years. The official Wall Dog Museum is also located in right down town Pontiac. 2) Once you pull into town, consider starting your tour off at the Route 66 Hall of Fame & Museum Complex. Most of the wayside exhibits are located out of town and in various locations which will require you to drive a distance to see them. 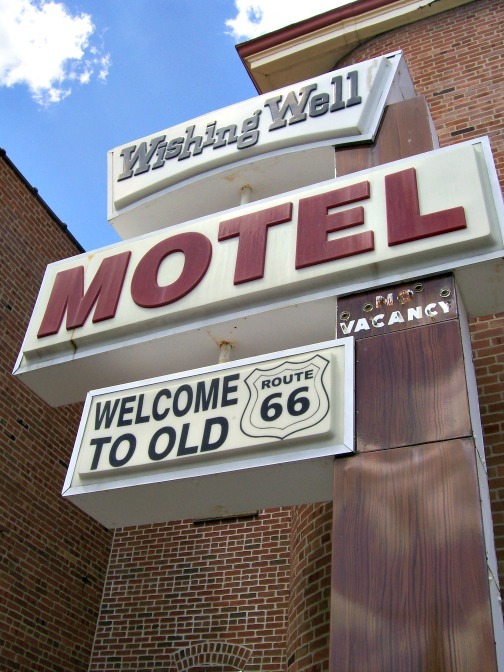 Once you pull into town you will be inundated with Route 66 attractions, and it can be overwhelming, especially if you are just passing through and not staying for more than a few hours. An ideal way to get started touring the downtown Pontiac portion is to begin at the Hall of Fame & Museum. This spot is kind of the epicenter of the Pontiac Route 66 attractions. The front of the building faces Howard Street, but if you head around back, you will find the world’s largest Route 66 shield, the Bob Waldmire’s bus, the 6th wayside exhibit post and an entrance into the Route 66 Hall of Fame. Plenty of brochures and additional information can be found along the back side of the building, just behind the bus. 3) Eat at the Old Log Cabin Restaurant. The Old Log Cabin Restaurant is located outside of town, and it is one of the wayside exhibit stops. It is still open for business, still serving great food and still in it original location, although it has been altered in a few interesting ways, read more about it, here. 4) Map your route beforehand. Print a google map that includes the Pontiac attractions, here. Find the Wayside exhibits map co-ordinates, here. 5) Consider riding the old route in or out of town and stopping off at some of the other towns. 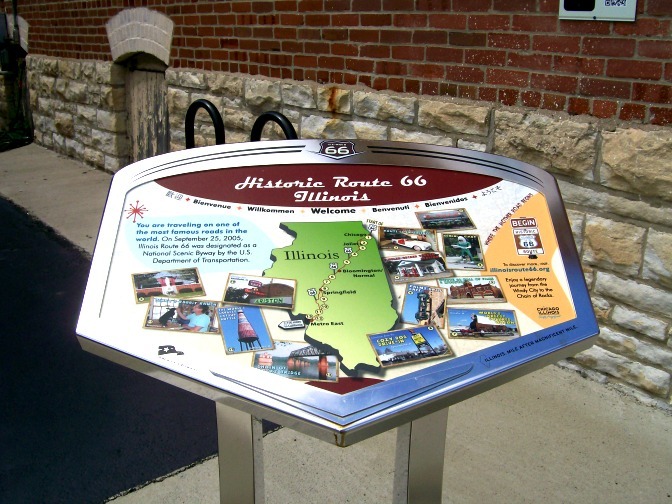 If you are going to actually set off to see some of Pontiac, Illinois, there are plenty of other well deserved Route 66 stops that you might be passing by along the way, depending on where you are coming from or going to. Go for the gold and see as many as you can, if time permits, and hopefully, it will. See more info and maps of the surrounding Red Carpet Corridor (Route 66 attractions) near Pontiac, here and here. We had an amazing time visiting Pontiac last summer, but I really would have liked to have seen more of the real deal—> the wayside exhibits, even if they are mere apparitions of the original Route 66. That is the reason why I wanted to post about this because I didn’t think that many would take into consideration the difference between tribute and historical attractions until after they stopped off. Don’t get me wrong, ALL of the attractions are amazing to see, but I can’t help but like the idea of standing on Route 66 hallowed ground, even if only to feel the breeze blowing through my hair. Here is a quick YouTube slide show of our visit to Pontiac. It even comes with a musical track of cheese on the side. Enjoy!! so cool!!! Thanks for sharing your trip! You certainly should work for the tourism industry!. I think I will add this to my bucket list and that’s all because of you. Love the video. How fun to read about old familiar places! We used to go to the fireworks in Pontiac every year. 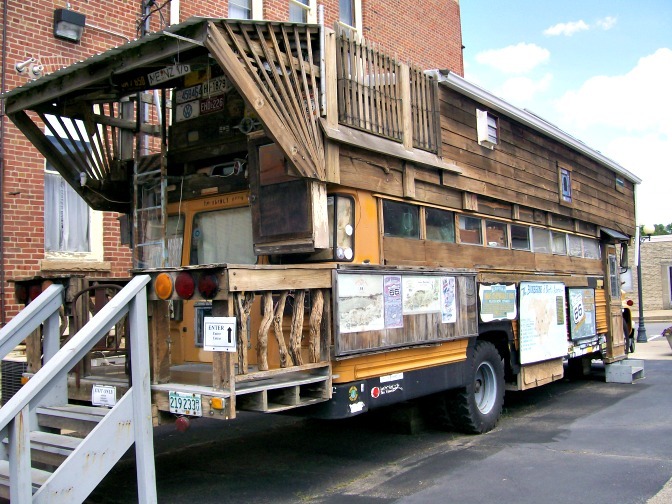 That bus there is pretty wild looking! The video is so well done. I’m going over to Mapquest to figure out how long it would take me to drive to Pontiac. If I’m ever in Pontiac, I’ll have you to thank for all the fun things I do. You mentioned Memphis, the husband is heading to TN next week. I wonder which part….maybe I’ll have to hook him up with your blog post on Nashville if that’s where he’s going. I wanna drive route 66 it looks so amazing, I have loved these posts Amy.